Hilary Swank was awarded with the Best Actress Oscar for her performance in “Boys Don’t Cry”. 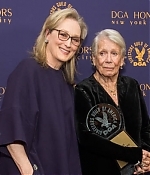 Meryl, who attended the ceremony with her husband and her daughter Grace, was nominated in the same category for “Music of the Heart”. The Golden Globe Award for Best Actress in a Drama went to Hilary Swank for her performance in “Boy’s Don’t Cry”. Meryl was nominated in the same category for “Music of the Heart”. Cross your fingers when the Oscar nominations are announced on February 15, 2000.